It’s Wednesday, which means it’s time for ‘Essay Day’ here at Fade to Lack. As explained here, I have written a large number of essays during my time at the University of Colorado as a student in film studies, and I thought it time to share the best of those with my readers, so throughout the summer, I’ll be posting a new essay every Wednesday, all focused on film in one form or another, but often incorporating other research and fields of study. This week’s selection is a research/analytical paper written for a seminar on “Cinema and the Historical Avant Garde,” in the Spring of 2013. 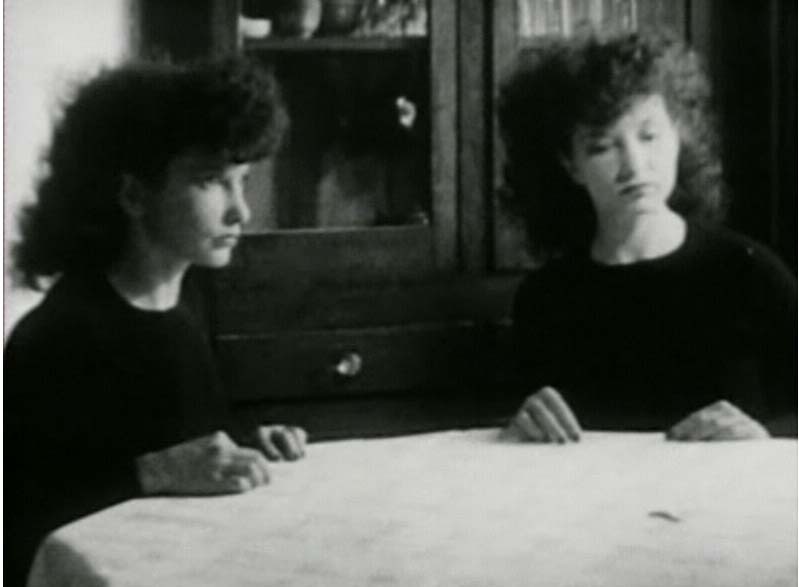 The subject is Maya Deren, my favorite avant-garde filmmaker, and in particular, her two greatest masterpieces – Meshes in the Afternoon and At Land. The rest is fairly self-explanatory, as the essay contains a lot of information on her life and background, and I have embedded the two short films at the end of the article for those who would like to see them. As a brief aside, this essay was submitted under the title “The Illusion of Life: From Eleanora Derenkowskaia to Maya Deren to Cinematic Visions from the Beyond,” which is a really dreadful and pedantic title (I am good at writing essays – naming them, not so much). I had started writing the paper under the title “Maya Deren in 3D!” as a joke, but I liked the silliness of that temporary title so much that I thought I’d bring it back here – expanded a little bit to be more descriptive – because, while utterly nonsensical, it is several magnitudes more entertaining than the actual name of the paper. Poet. Author. Reporter. Dancer. Critic. Actress. Ethnographer. Choreographer. Photographer. Filmmaker. Self-made legend. Attempting to get a firm grasp on the literal or artistic identity of Maya Deren is like attempting to carry water with one’s bare hands. One may hold it all together for a couple of seconds, but it will inevitably slip away through the cracks. 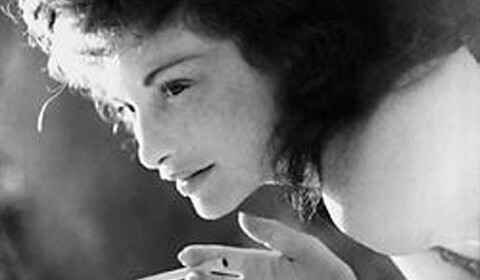 In just 44 years of life, Maya Deren achieved a nearly incomprehensible set of accomplishments, and continually reinvented herself, expanded her artistic interests, and pushed at every boundary she encountered along the way. “...She lived her life from early on as if it were a continual series of “real pulsating urgencies” – always racing against the clock to get the greatest amount accomplished in the shortest amount of time (Jackson 2).” Living less urgently, as most of us do, it is difficult to connect with the enormity of Deren’s interests, undertakings, and influences; indeed, the best way into her work, so many years after the fact, is to find a personal starting point, a piece of the legend that holds individual fascination, and to follow Deren’s art wherever it may lead. I, personally, am attracted to the notion that Deren’s cinematic career was born from death. It was the small inheritance she gained from her father’s passing that allowed Deren to purchase her first 16mm film camera, and with this in mind, I cannot help but view the works that followed – Meshes of the Afternoon (1943) and At Land (1944) in particular – as equally rooted in concepts of mortality (Zeitgeist Films 3). Visually, tonally, thematically, and even narratively, these two masterpiece shorts may be viewed as a nearly seamless double-feature journey into the realm of death. Though only Meshes deals with it overtly, death connects these films, and analyzing them in tandem reveals a larger exploration into the point at which basic human challenges of mortality and identity converge – and how running from an encounter with one invariably leads us to confront the other, at which point we may glean a measure of transcendence. Maya Deren was born Eleanora Derenkowskaia on April 29, 1917 in Kiev, the very same year as the Russian Revolution (Melton 9). Five years later, her family came to the United States, but it would be another 21 years before she adopted a new name, and stepped into the most legendary of all her artistic passions (Melton 9, Jackson 33-4). Before she began creating films, Deren had already lived a prolific life. Her resume from February of 1941 sees her having attained both Bachelor’s (in three years) and Master’s (in one year) degrees in English, studied abroad for a total of four years in Europe, worked as a newspaper and radio reporter and copy-writer, served as the Publicity Director of Syracuse University’s dramatics department, translated multiple French novels and short stories professionally, worked as a French reader for Simon and Schuster, and performed editorial duties for a long list of scholarly journals and publications, in addition to ghostwriting three books (Melton 432). All this before Deren had turned 24. But her laundry list of professional accomplishments does not accurately summarize just how broad Deren’s interests were, nor how fierce she was in pursuing her artistic and intellectual passions. Her resume does not mention her intense interest in socialist politics – she served as secretary of the Young People’s Socialist League her senior year of college – nor her obsession with poetry, an exploration into Symbolist and Imagist styles of which was the subject of her “enormous” master’s thesis (Jackson 21, 2). Poetry, in fact, is the foundation of most of Deren’s artistic endeavors, for it was poetry that would ultimately lead her to many of her most notable artistic outlets. The letter her 1941 resume derives from, in fact, was directed towards Katherine Dunham, a famous dancer, choreographer, and star of the touring Broadway musical Cabin in the Sky (Melton 417). Deren, using knowledge gathered from her familiarity with publishing companies, felt there was need for a children’s book on dance, and was intrigued by the possibilities of textually representing dance through poetry. “The text, as I see it,” she wrote in her proposal, “should be a sort of poem; the illustrations – simple drawings of poetry in motion (Melton 431).” She sought out Dunham not because of need for employment, but simply to further her own theories on art (Dunham was the subject of her proposal because Deren believed the woman had “an authentic anthropological knowledge of the dance”), and her extreme force of will in achieving such ends shines not only throughout the letter, but through what came next (Melton 431). Dunham agreed to assist Deren, and their partnership flowered, with Deren eventually gaining a previously nonexistent secretarial position with Dunham, touring together around the country and writing profusely about dance, anthropology, and, of course, poetry along the way (Melton 417). ...The reason that I had not been a very good poet was because actually my mind worked in images which I had been trying to translate or describe in words; therefore, when I undertook cinema, I was relieved of the false step of translating image into words, and could work directly so that it was not like discovering a new medium so much as finally coming home into a world whose vocabulary, syntax, grammar was my mother tongue (Millsapps 23, Deren 30). Meshes of the Afternoon and At Land, the focus of this study, are obviously poetic in their construction and basic visual language. Stylistically, Meshes is built around a small set of images – two rooms, a staircase, a sidewalk, a flower, a key, a knife, a chair, two human figures, one inhuman figure, and a mirror – and repeats and rearranges these images in a circular, repetitive structure, just as how certain words or turns of phrases may recur, in increasingly varied textual contexts, over the course of a poem to alter and play with their initial meaning. At Land is not about recurrence, save for the very end (though it arguably echoes major visual motifs from Meshes at several points), but is still constructed and edited poetically, with imaginative, interconnected imagery and a strong sense of the intangible. To chronicle her activities and successes in order to prove to her potential funding sources that she was worthy of receiving their financial aid; to save money by acting as her own publicity agent; and thereby to have a controlling hand in the image she wished to cultivate about herself and her films (13). It is also likely that Deren’s independent streak stemmed in some part from her presence as one of the only female filmmakers working during the period. “For a woman to become a film-maker was extremely rare in the Forties, and no doubt Deren’s isolation motivated to some extent the avant-garde stance she took from the outset (Melton XII).” Indeed, Deren’s gender automatically placed her on the artistic fringes, and far outside the realm of ‘commerce,’ but as befits her intense personality, she did not see this as a roadblock, but embraced the possibilities of forging her own path. Deren was not America’s first experimental filmmaker (an accomplishment her legend is sometimes erroneously inflated to include), but she was certainly among the first to break through barriers by doing it well. With no handbook to refer to, and few cinematic examples to draw upon in shaping her vision, what Deren did on film was groundbreaking, the power and far-reaching influence of her movies quickly eclipsing whatever societal disadvantage she had as a woman. Deren’s shift from poet to filmmaker would stick, by and large, for the rest of her life (even her later-life interest in ethnography, including Haitian dances, would be explored through film) and the change in artistic preference dramatically coincided with her disposal of the name ‘Eleanora’ and adoption of the name ‘Maya’ (Jackson 2-3, Millsapps 22). The name which she would make legendary is a Sanskrit phrase for the “illusion of life,” which seems more than appropriate for the work she would create (Millsapps 22). Maya was not just a name, but a mission statement, for the “illusion of life” is a central thematic and intellectual concept behind virtually all her films, and is a core tenant of this analysis. For if life is illusory, and what we sense cannot always be trusted as truth, then death, the flipside of life, must be an equally tenuous concept where nothing is certain, and the possibilities are endless. All are valid points worth further research and elucidation by all fans of Deren’s work. None, however, are relevant to this particular analysis, which is based primarily in finding emotional and thematic connections between Meshes and At Land, and finding a larger reading within. There is no indication I can find that Deren explicitly intended At Land to act as literal sequel to Meshes of the Afternoon, nor anything in her personal life – beyond the anecdote about the camera and her father’s inheritance – to suggest death weighed heavily on her mind during the period she produced these films. Yet seventy years removed from their creation, these works now exist outside the hands of their creator; understanding the context in which they were made is essential, and enriches any reading of the work, but I am more interested in a personal reading based solely in the provocative texts the films themselves provide. In broad strokes, my general view of the connected arc of the two films is this: Meshes of the Afternoon, while elliptical and non-linear in its narrative, points toward death at all times. Through the hooded, mirror-faced figure that serves as an omnipresent antagonist of sorts, on through the recurring transformation of a key into a knife (suggesting a knife as having the power to ‘unlock’ something), all elements of the film contribute to a morbid momentum that moves towards death. And at the end, death is indeed consummated, when the many dissociated selves the central character, played by Deren, experiences are ultimately united in what may or may not be a suicide (but is clearly death nevertheless). Thus, identity is also emphasized as a key crisis, and is resolved through death. At Land – which can naturally be seen as a next step for the Deren character due to the shared beach imagery in both films (which shall be discussed at length later) – flips the crisis, so that Deren – now in the realm of ‘death’ – is not confronted with dissociated ‘selves’ on her journey, but with others, many of whom do not appear to notice her. The significance of this is multifold, but the general impression one gets is that even in this world of death, one cannot escape a crisis of identity, and that identity is shaped by the way we react to different settings and encounters. The introspection of Meshes, symbolized by meeting oneself multiple times, is replaced with a more retrospective quality, and viewed as a two-film arc, the cycle culminates in an acceptance of all truths gained throughout this trek through life and death. This is the broad version of the theory. In even briefer terms, the momentum of Meshes indicates an increasingly conscious desire for death as an escape from an identity crisis, and At Land functions as the next step in this cycle, exploring and ultimately coming to terms with identity on the other side of life. Going deeper requires starting with representations of death in Meshes and their significance. First, we must look to the sheer amount of violent imagery in the film, which is a point of fascination for critic Maureen Turim: “Knives, the shattered mirror face, and the mermaid suicide provide direct representation of violent fantasies, and the power of Deren’s editing is connected to the violence of her desires (75).” She goes on to suggest a very provocative notion that is key to this analysis: That of parapraxis, “the psychoanalytic term for the traces of failed actions (75).” These violent objects are governed by parapraxis, and stem from “an unexpressed desire or conflict (75).” A simple extrapolation of this idea suggests that, since the film is almost entirely dreamt by the main character, the objects she envisions are, psychologically speaking, physical manifestations of violent impulses. As these objects are directed at herself, via the many dissociated selves that are created over the course of the film, it is easy to view the conflict of Meshes stemming from an unconscious or subconscious desire for suicide (the fact that we do not see a full shot of Deren out of her own POV until she begins dreaming further suggests this is a journey through a repressed conscious). If parapraxis is part of the character’s psychological dilemma, it can be assumed that she has attempted suicide before. 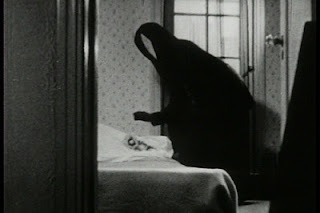 The role of the ‘grim reaper’-esque figure that haunts the film is important in decoding possible suicidal impulses as well. The black-cloaked figure has a mirror in place of a face, meaning that if Deren looks into it, she will only see herself – death directed inward. That she does not look directly into the mirror face of the reaper is significant; it is another ‘delayed’ suicide, one among many glimpsed throughout. The reaper is also essential in analyzing the most iconic moment of the film – that of Deren looking out through a window, hands pressed against it, a bright reflection of light bouncing atop the frame. 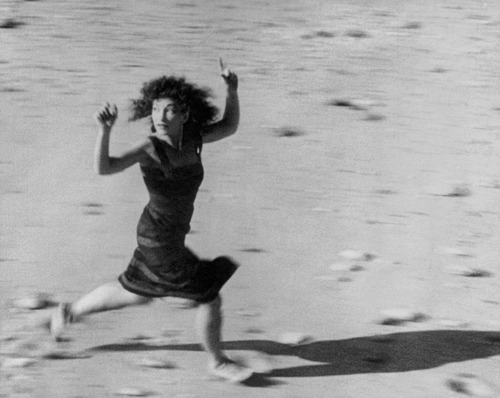 As Maria Pramaggiore writes: “At that moment in the film, Deren is a spectator gazing through the window at “another” Maya Deren ... the simultaneous coexistence of these two Mayas forces viewers to rethink the traditional opposition between self and other ... (237).” Indeed it does. And while this shot is often discussed and dissected as a static image, it must be viewed in motion for it to be truly appreciated. This is the first dissociated self Deren shall encounter, and it is absolutely critical to note the small, sly, nearly imperceptible smile that flutters across her face as she looks at herself, down below on the sidewalk, chasing the reaper figure. Another self, chasing death. Why would the character smile at this? It appears to me a look of bemused realization – the same look any of us would have if we could see our own self, displaced from time, and gain new perspective on an action or moment that confused us in the past. When Deren first chased the reaper, it seemed that she did it because she did not know who or what it was. But now that Deren looks at herself doing this, she sees the action for what it is: Chasing after death, possibly out of a desire to join with it. 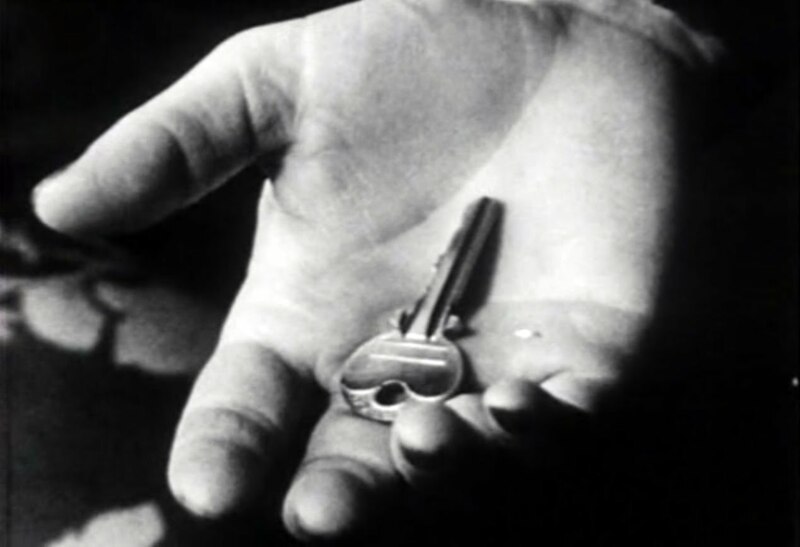 What had been unconscious (a desire for death) is now conscious, and as a signal of this, Deren’s first action after moving away from the window is to pull a key from her mouth – a key that, on multiple viewings, we know will become a knife, meaning that a realization of death leads to the summoning of a tool of death. As the girl with the knife rises, there is a close-up on her foot as she begins striding. The first step is in sand (with suggestion of sea behind), the second stride (cut in) is in grass, third is on pavement, and the fourth is on the rug, and then the camera cuts up to her head with the hand with the knife descending towards the sleeping girl. What I meant when I planned that four stride sequence was that you have to come a long way – from the very beginning of time – to kill yourself, like the first life emerging from the primeval waters. Those four strides, in my intention, span all time (Sitney 498-508). The suicide is interrupted here once again, this time by the entry of the male character into the film, but understanding Deren’s intention in this sequence – connecting suicide, as an impulse, to the enormity of time and human experience – is important. It connects this urge for death to something larger than one character’s struggle, and also suggests a sense of desperation – that if the action of suicide really does take a time-spanning evolution to execute, the desire that spurs the action must be extreme. The easiest reading, then, is that this suicidal impulse comes from an identity crisis of sorts, manifested in the dream by the procession of dissociated selves, all moving through similar scenarios without a clear sense of direction. This is an incomplete reading of the multiple selves conceit, but in transitioning from Meshes of the Afternoon to At Land, it is the best and simplest one to use. For identity will recur as a theme in At Land – in fact, it is one of the main connecting points between the two films. Viewed in quick succession as a two-film cycle, events at the conclusion to Meshes and beginning of At Land strongly suggest a connection. The action that seemingly summons true, ultimate death in Meshes is Deren’s smashing of the glass near the very end; she uses the knife, a weapon that up to that point kept getting delayed in its purpose, to break an unseen mirror which, once shattered, gives way to an expansive beach. When the man walks in during the final scene to see Deren dead, she is covered in seaweed, and the floor in glass – implying that the smashing of the mirror was the consummation of suicide, and that the beach is the film’s manifestation of the realm of death. In At Land, Deren then wakes up on a beach that looks extremely similar. 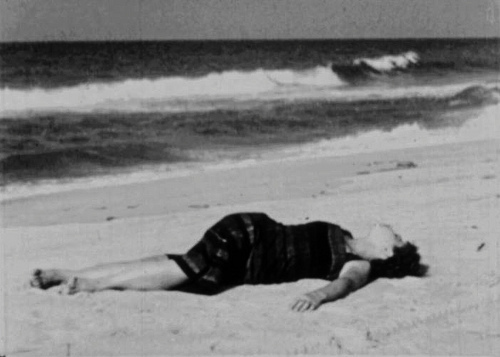 Not just that, but the way the film opens, with waves crashing violently upon waves, suggests she is ‘washed’ ashore, as though she has been transported from one point to another. These are all very surface-level details, but when viewing the films together, they play as more than mere coincidences. At Land seems to flow entirely naturally out of the thematic arc of Meshes, with the character of the first film now entering the previously glimpsed realm of death. The exploration that follows is, in a sense, a thematic mirror of the previous film. It should be stated up front that At Land is both a simpler and more complex film to dissect, as it is more obscure and less precise by design. As Sitney notes, “trance films in general, and At Land in particular, tend to resist specific interpretation (513).” Indeed, taken on its own, At Land is somewhat inscrutable, which is part of its power and intent. It is a journey without a specific destination, where spots along the way make little literal sense and where the emotions one feels while watching are the important takeaway. In short, where Meshes of the Afternoon dramatizes a dream for us to see, At Land aims to cinematically recreate the sensation of dreaming for us to experience. Indeed, the most important scene here is the final one, where Deren, having returned to the beach, steals a chess piece and begins to run, suddenly summoning her prior identities from throughout the film. Now there are more many dissociated Derens, each looking at their final incarnation running away from them. Two major thematic points are thus made. First, that identity is forged through experience, and is therefore constantly altered, dissociated, and shed, because each encounter one has forever alters one’s identity. If viewed irrespective of time, we all contain numerous personas within ourselves. Second, that once one has realized this, the only thing to do is run forward, full speed ahead, ignoring the many identities one has had in favor of staying strong, singular, and unitary as one moves on through the world. Letting oneself dissociate, and fretting over the ensuing identity crisis, is a sure path to destruction. Self-destruction, in fact – we have already seen so in Meshes of the Afternoon. “A constancy of personal identity,” then, is the answer to most every problem raised throughout the two-film cycle. An inability to find such constancy creates a desire for (and ultimate consummation of) suicide in Meshes, and in a post-mortem realm, the character is then able to ruminate on this, find the larger truth she had previously missed, and move forward knowing how to live a fuller existence (whether in this life or the next). At this point, though, the nature of this dreamscape, or post-mortem vision, is still unknown to the character and the audience. A chess pawn that falls from the table – and leads Deren down a succession of rocks into a river – is set-up for later. She chases it without fully understanding its meaning, but when she finally grasps it at the end and runs away, the pawn will serve as a totem for her (and the film’s) ultimate realization about identity. Coming full circle, Deren returns to the beach, where the sly smile from the window scene in Meshes returns as she looks at the two women playing chess. It is a practically identical expression to the one she wears in the prior film’s most iconic shot, but now it comes at the climax of the two-film cycle, and triggers the previously discussed revelation of time in relation to identity. Deren takes the pawn and runs – away from her past selves, away from her identity crisis, away from this realm of death, and away from the viewer. The arc has been fulfilled, with a flight from identity leading towards an encounter with death, leading all the way back around to a final encounter with, and internalization of, identity’s true nature. The character, in a sense, is ‘whole,’ at least for the purposes of this story, and now we no longer need follow her. The tale is done. 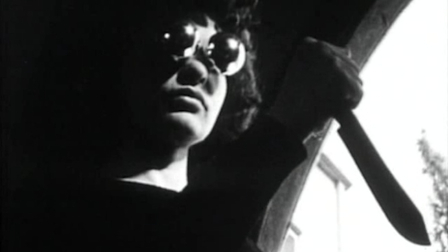 Maya Deren and her legacy are too vast and complex to be completely captured by a single analysis. Even looking to a multitude of critical and historical sources cannot be enough to fully grasp the sheer force of artistic will she exhibited in life, nor the volume of thematic and emotional takeaways her filmography – small but immeasurably powerful – has to offer. I have endeavored only to relate a personal understanding of her two most significant films, and in so doing, am convinced her work remains relevant and affecting, even seventy years later. Many readings exist of these films, and many more shall be performed in decades to come, but I feel an unshakable sense of transcendence watching her films. Grappling with death and identity are fundamental human experiences, basic difficulties we all struggle with over the course of our lives, and if such concepts are indeed part of the fabric of these films, the path she traces towards finding a healthy, sustainable balance between the two is emotionally stirring, intellectually dense, and intensely relatable. Meshes of the Afternoon and At Land may be masterpieces on their own, but viewed together, they reach new heights, unlocking a truly transcendental vision of how life at its most chaotic may be meaningfully lived, and remaining as vibrant, fascinating, and multifaceted as Maya Deren herself to this very day. At Land. Dir. Maya Deren. Perf. Maya Deren. 1944. YouTube. Deren, Maya. Letter. “Notes, Essays, Letters.” Film Culture. Winter 1965. P.30. Print. 1961). Lewiston: Edwin Mellen Press, 2002. Print. Works. New York: Anthology Film Archives/Film Culture, 1984. Print. Meshes of the Afternoon. Dir. Maya Deren and Alexander Hammid. Perf. 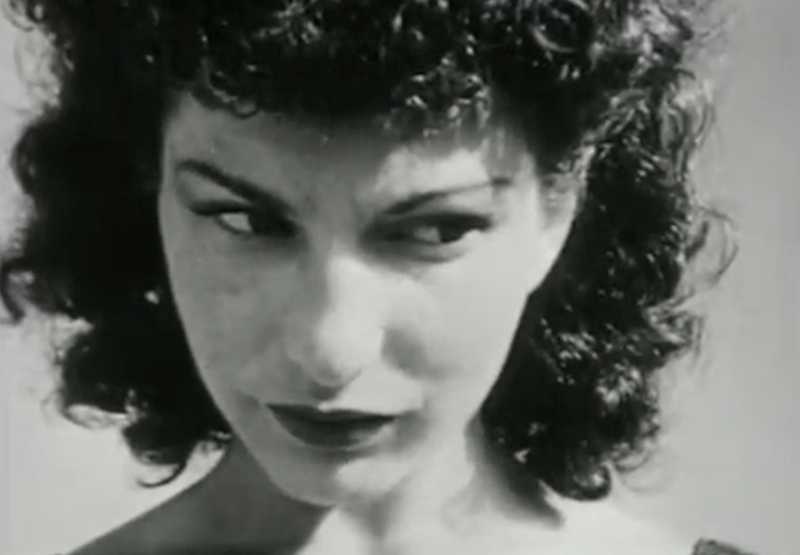 Maya Deren. 1943. YouTube. 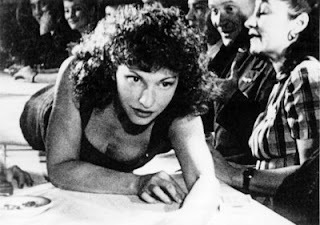 Millsapps, Jan L. “Maya Deren, Imagist.” Literature Film Quarterly. Volume 14. Issue 1, 1986. American Avant-Garde. Ed. Bill Nichols. Berkely: University of California Press, 2001. Pp. 237-60. Print. Oxford University Press, 1974. Kindle E-Book. Petrolle and Virginia Wright Wexman. Urbana: University of Illinois, 2005. Pp. 71-90. Print. Zeitgeist Films. “In the Mirror of Maya Deren Press Kit.” 2002. PDF file. #6 – Is Borat: Cultural Learnings of America for Make Benefit Glorious Nation of Kazakhstan Documentary Not? Jonathan R. Lack has been writing film and television criticism for ten years, for publications such as The Denver Post’s ‘YourHub’ and the entertainment website We Got This Covered, and is the host of The Weekly Stuff Podcast with Jonathan Lack and Sean Chapman. His first book – Fade to Lack: A Critic’s Journey Through the World of Modern Film – is now available in Paperback and on Kindle. Follow him on Twitter @JonathanLack.